How about a dinner with a French touch on the table in about 20 minutes? 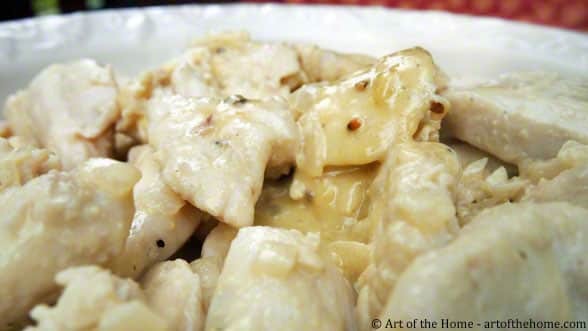 One of our favorite sauteed chicken recipes is this “émincé de poulet à la moutarde” where you cook thin strips of chicken in a creamy Dijon mustard sauce – si bon! It includes two French kitchen staples: Dijon mustard and creme fraiche. This marriage results in a delicious creamy sauce with a gentle spicy bite to it. Sauteed chicken recipes are great because they are quick and also quite versatile. With sauteed chicken recipes, simply change the sauce, the side dish, and voilà, you have a different dinner. Variety is the spice of life and can also be a big help in anybody’s diet — we eat slower when we don’t always eat the same thing and explore different types of food or dishes. This creamy Dijon mustard sauce is so easy and quick to make! It will reduce in less than 10 minutes — pretty fast for such a delicious sauce. And picture this: get some pasta (or rice) going after you’re done cutting the chicken into thin strips and that chicken émincé in Dijon sauce will be done by the time your side dish is ready. How do you like that? That means dinner on the table in about 20 minutes — love that! There is not much preparation needed, simply mincing one shallot and slicing the chicken. Hence the name “émincé ” by the way which implies that the chicken has been cut into thin strips (“mince” means “thin” in French). Slicing the chicken into thin strips allows the sauce to coat more of the chicken so you really enjoy the taste of the sauce. We also found that when meat is cut into smaller pieces, you tend to put less on your plate – always a plus for portion control. So check below for Art of the Home chicken émincé in Dijon sauce recipe, as well as Art of the Home menu suggestions. Hope you enjoy all that free time! Slice chicken into thin strips (about 6 to 8 per breast) and dry chicken with paper towels (they’ll brown better). Mince your shallot. In a large skillet or an enameled cast-iron casserole, heat olive oil and cook minced shallots for 1-2 minutes over medium to high heat. Add chicken strips and cook on both sides to brown — about 5 minutes total. Sauteeing tip: don’t turn the chicken over too soon otherwise it will stick to the pan — wait about 2 minutes before flipping the chicken over. Add broth or wine to deglaze the pan. Scrape the brown bits from the bottom of the casserole or skillet with a rubber spatula or wooden spoon. The caramelized bits of chicken and shallots will give a great tasty flavor to your sauce. If needed, increase heat to high so the liquid maintains a gentle boil. Mix in salt and pepper. Add in mustard and creme fraiche. Stir so each chicken strips is coated with the sauce. Cook under medium heat until chicken is done (about 5-10 minutes). As the chicken is cooking, occasionally scrap the side and bottom of the pan. When the chicken is cooked, remove and set aside covered to keep warm while you are reducing the sauce. If needed, increase heat to high again so the sauce maintains a gentle boil. Stir, scrapping the side and bottom of the pan until sauce has reached your desired thickness (5-10 min). At that point the liquid should have reduced by about half. Check seasonings and add salt & pepper to taste if necessary. Return chicken to the pan using a fork or kitchen tongs (you can also “dump” the chicken directly into the skillet but you will get quite a bit of chicken juices as well which will change the texture of your sauce). Under medium heat, gently stir to generously coat the chicken with the sauce. Warm it up for a few minutes and serve in a deep serving dish or individual plates. Menu Ideas for Sauteed Chicken Recipes: serve as a main course with a side dish of rice, pasta, or gnocchi. Low Carb Options with Sauteed Chicken Recipes: serve on a bed of sauteed mushrooms or bed of leeks – very satisfying and pretty too. Sauteed Chicken Recipes “À l’Ancienne” (The Old-Fashioned Way): instead of a smooth Dijon mustard, try the Dijon “Moutarde à l’Ancienne” (e.g. Maille Old Style Whole Grain Dijon mustard).